1854, lords and ladies, 1854. Kerosene was “invented” by a Canadian named Abraham Gesner. He received the patents for the stuff, and coined the name (like a lot of 19th century industrial product names, we use the trademarked nomen as the descriptor for the entire category. It’s the same shorthand we use for facial tissue as being “Kleenex” or photocopying as “Xerox”) for a distillation of coal oil. Gesner was looking for a way to get an angle on the lamp oil trade. In 1854, lamp oil was produced from animals, in particular from fish and especially whales. 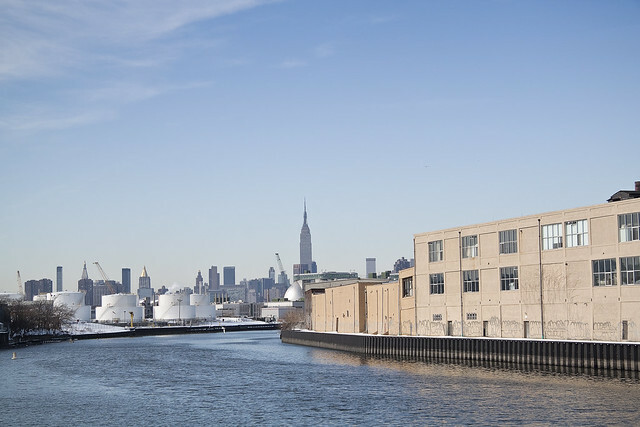 When the time came to set up shop and build a factory to produce his coal oil, it was along the Newtown Creek that Abraham Gesner built the first large scale Kerosene works in North America – in what we call Queens. Gesner’s research in minerals resulted in his 1846 development of a process to refine a liquid fuel from coal, bitumen and oil shale. His new discovery, which he named kerosene, burned more cleanly and was less expensive than competing products, such as whale oil. In 1850, Gesner created the Kerosene Gaslight Company and began installing lighting in the streets in Halifax and other cities. By 1854, he had expanded to the United States where he created the North American Kerosene Gas Light Company at Long Island, New York. Demand grew to where his company’s capacity to produce became a problem, but the discovery of petroleum, from which kerosene could be more easily produced, solved the supply problem. Abraham Gesner continued his research on fuels and wrote a number of scientific studies concerning the industry including an 1861 publication titled, “A Practical Treatise on Coal, Petroleum and Other Distilled Oils,” which became a standard reference in the field. Eventually, Gesner’s company was absorbed into the petroleum monopoly, Standard Oil and he returned to Halifax, where he was appointed a Professor of Natural History at Dalhousie University. This was Gesner, who kind of looked a bit like General Zod in my opinion. The North American Kerosene Gas Light Company, later the New York Kerosene Company, would eventually be acquired by Charles Pratt and folded into his growing Astral Oil empire (Pratt’s own Kerosene refinery was centered at Bushwick Inlet at the border of Greenpoint and Williamsburg) and would became a part of Standard Oil when Pratt joined forces with John D Rockefeller. The Gesner works are often mentioned by environmental officials, but no one ever gets specific about where they were. You’d think the first large scale petroleum refinery in the United States would have left behind a plaque or something, but welcome to Queens. A bit of work has gone into screwing down the exact location of the facility around Newtown Pentacle HQ in recent days, and I can tell you that the footprint of the North American Kerosene Gaslight Company was incorporated into what we now refer to as Pratt’s Queens County Oil Works – which is in Blissville and across the street from Calvary Cemetery. Equidistant from the Greenpoint Avenue and long demolished Penny Bridges, this is the site of the Blissville Seep, which I’ve been rattling on about for a few years now. 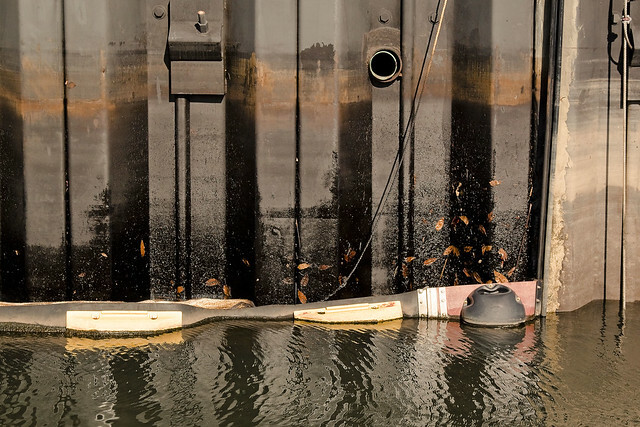 Sadly, oil is seeping out of a bulkhead on the Queens side of the Newtown Creek. Famously, the Greenpoint Oil Spill (click here for a link to newtowncreekalliance.org for more) occurred just across the water from this spot, but every indication points to this as being a separate event. The former site of Charles Pratt’s Queens County Oil Works, which was an approximately 18 acre parcel which would later be called the “Standard Oil Blissville works”, the sites occupation in modernity has little or nothing to do with petroleum. one in LIC, Queens and one in Greenpoint, Brooklyn. 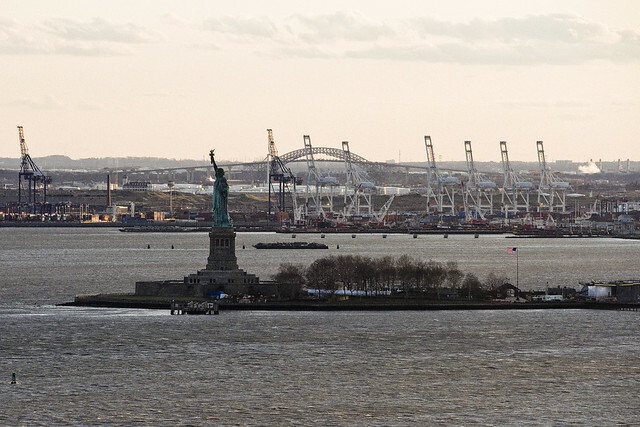 Glittering Realms: Brooklyn’s Greenpoint with Atlas Obscura, on Saturday May 17th. 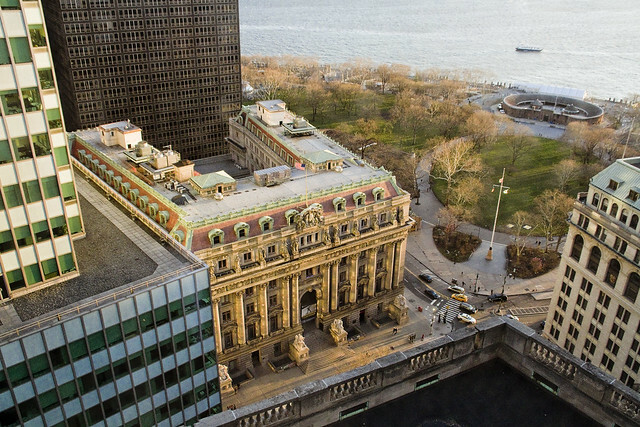 Modern Corridor: Queen’s LIC with Brooklyn Brainery, on Sunday May 18th. 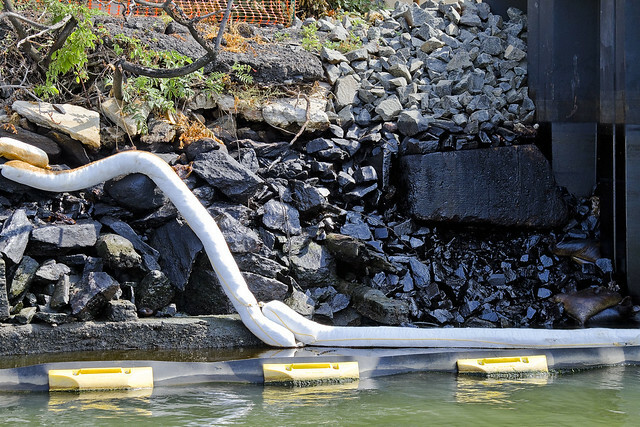 Welcome, by the way, to Newtown Creek- and to the “Blissville Oil Spill”. Just a note: For the purposes of this posting, I’m departing from the normal formatting, and the photos are presented along with the dates upon which they were captured. 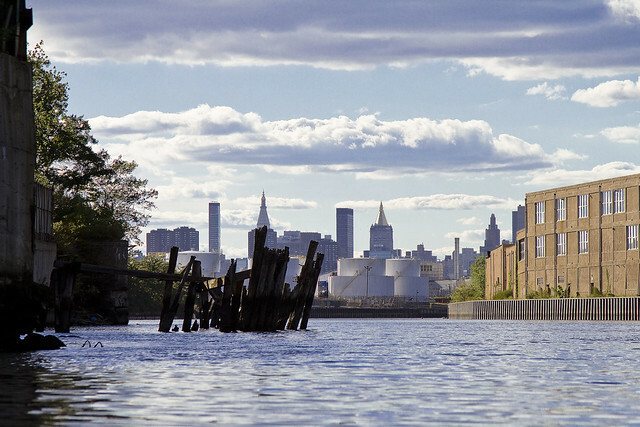 My practice for the last several years has been to shoot everything I see along the Newtown Creek, whether or not it seems significant at the time. This practice evolved out of the paucity of photographic documentation of the place which survived the 20th century, and the effort has been made with the notion of leaving behind something for future researchers to work with. As time has gone by, and my technological capabilities have expanded, I’ve developed quite a library of shots. 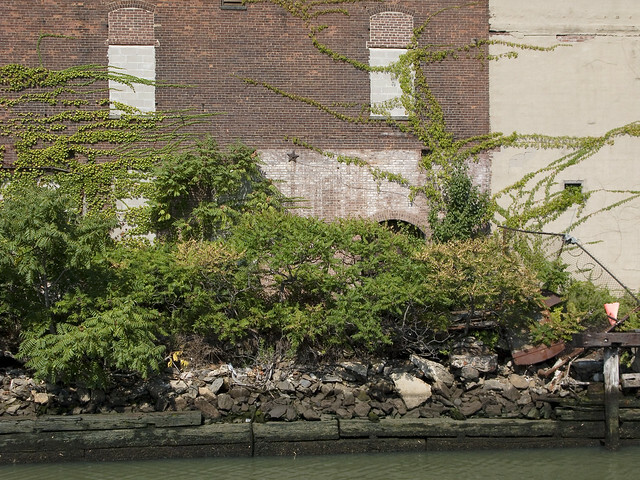 The photo above depicts the site in question during the autumn of 2008, and shows the historic condition of the bulkheads. 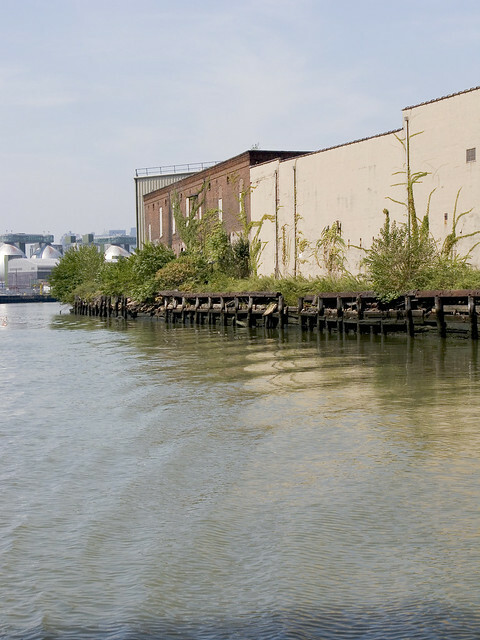 A standard codex for interpreting what one sees along the Newtown Creek states that wooden bulkheads are 19th century, reinforced concrete dates from the early to mid 20th, and steel plating is late 20th and early 21st century. This rule is not “scientific” but allows one to approximate the manufacture of these fallen docks to a relative time period. As you can observe in the shot above, the risible decay of the wooden bulkheads, and their manner of construction, speak to a long period of disuse and lack of maintenance as far as September of 2008. 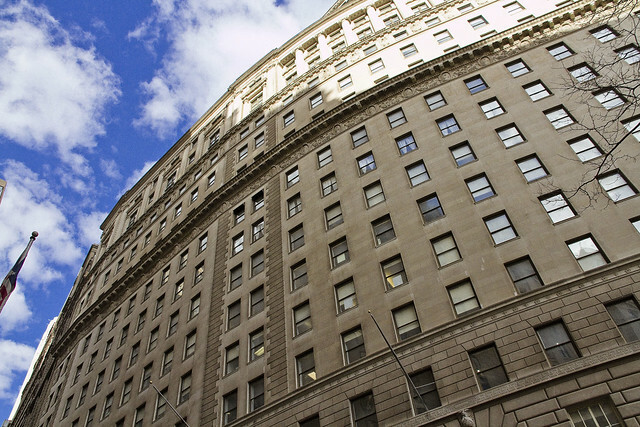 In the winter of 2010, a crew began to install modern steel plating along this frontage, which drew my interest. Again, anything that is in a state of flux along the waterway is a point of interest for me. 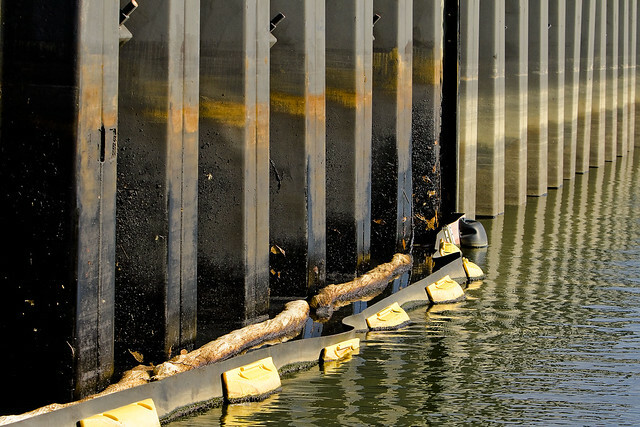 This project went on for several months, and was conducted from a barge with a small crane installed on it. 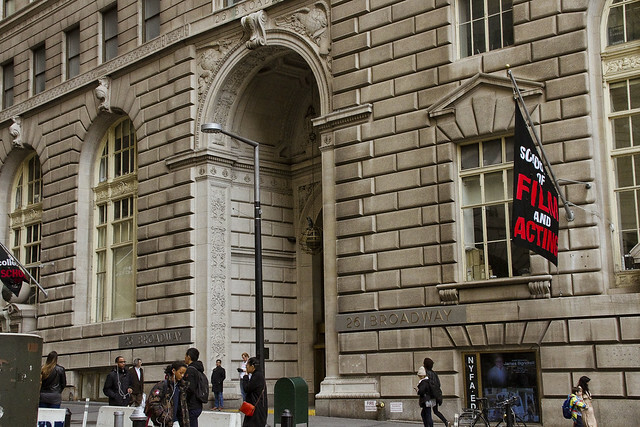 By the same period a year later, in February of 2011, the modern installation was complete. Conflicting reports on this style of bulkhead are often heard. The older wooden structures offer a structure for biological organisms to nest and shelter, but “slow” the already tepid flow of water through the narrow passages of the Creek. The steel ones “quicken” the flow, but offer no toeholds for organic life. Modern day, (December 2011) google maps screen capture, click here or the image above for the dynamic google map. This is an industrial cul de sac today, accessed by a private driveway. The companies which use this space are largely waste management oriented, warehouse operations, furniture refinishing, or other truck based businesses. Despite the presence of freight tracks through the middle of the site, few of these companies utilize their sidings. 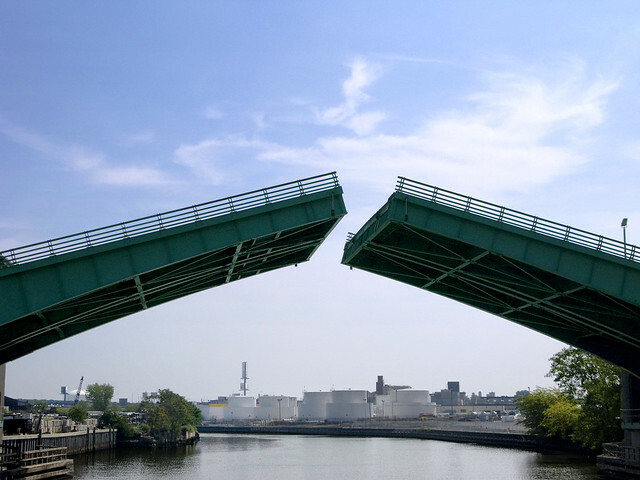 Calvary Cemetery and the Kosciuszko Bridge loom large and distinguish the area. 1924 view of the area, screen capture from “NYCityMap” at nyc.gov. 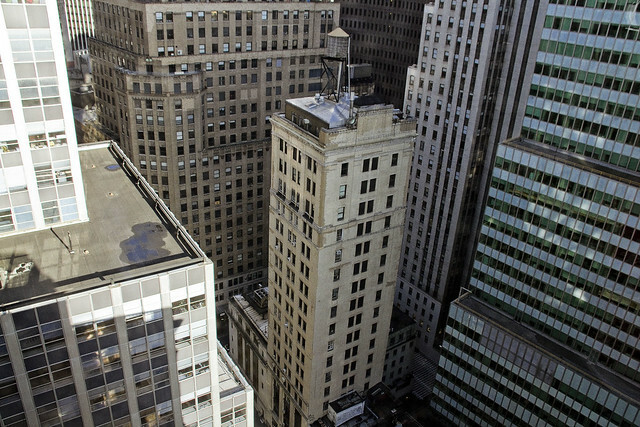 The oil tanks in the center of the site betray the presence of the “Queens County Oil Works” of Charles Pratt, which were also known as the “Standard Oil Blissville Works”. Blissville, of course, is the historic name of this part of Queens which was once a residential area. Clear plans of the area in 1936 overlaid with the 1924 aerial projection from NYCityMap. Click here to see a large version of the overlay. Detail view of the area, click here for larger incarnation. The works were here as late as 1951, but at this point, I still haven’t been able to confirm the date they were closed down. 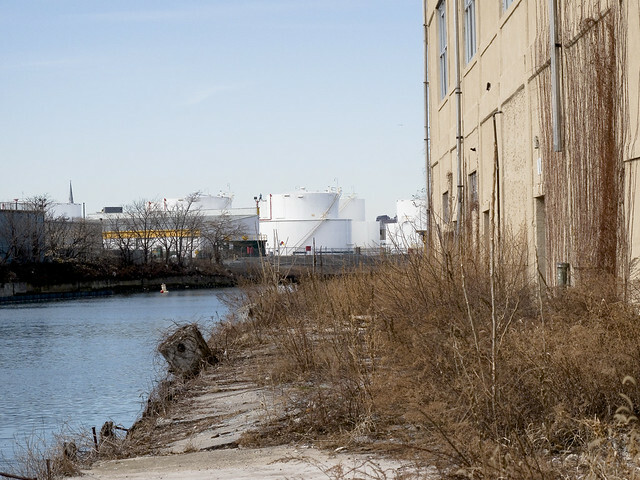 In the summer of 2011, I was tasked with photographing a “Bulkhead Survey” which members of the Newtown Creek Alliance were conducting. The good folks at Riverkeeper volunteered to take our party out on the Newtown Creek onboard their patrol boat, and when we were passing by the former Queens County Oil Works, we noticed the presence of both containment booms on the water and petroleum product flowing freely from the shoreline itself. The theory which has been advanced by knowledgeable sources is that when the steel bulkheads were installed, a process in which the plating is slid down into place and then secured, and that a sealed chamber or buried pipeline was likely ruptured during the construction process which freed “the product”. 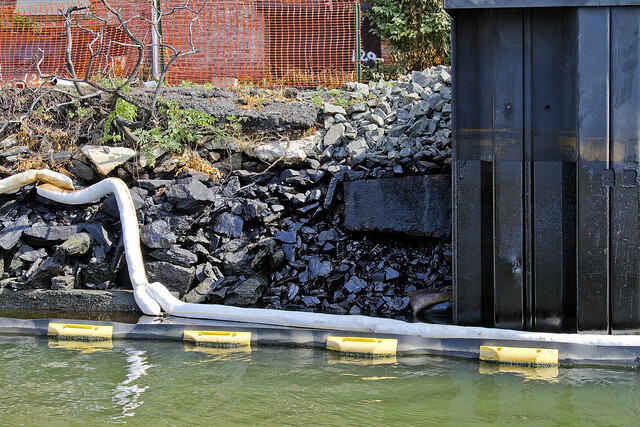 I have been asked to mention (by Newtown Creek Alliance and Riverkeeper itself) that investigation of the situation is underway, and the State and City officials responsible for policing this sort of thing are fully and enthusiastically engaged in the process. 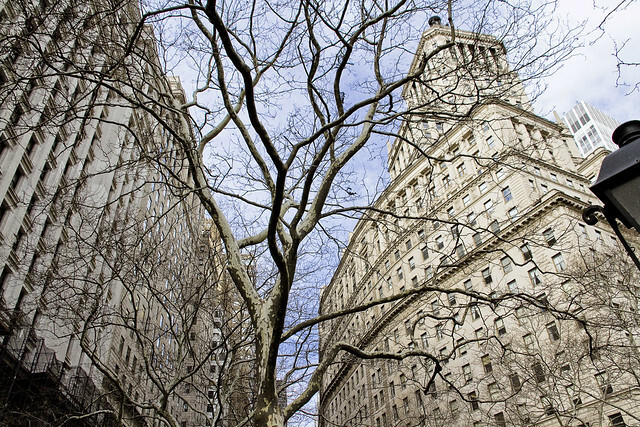 The story of Charles Pratt, his “Astral Oil”, and their involvement with John D. Rockefeller’s Standard Oil Trust will be discussed in a later posting on this subject, as the lengthy history would divert attention from this otherwise serious issue. Suffice to say that the Blissville works were some 18 acres in size, and suffered several “total loss” fires in the late 19th century. Note that this is a distinct property (and event) from the adjacent State Superfund site which is referred to as the Quanta Resources site. Again onboard a Riverkeeper patrol, this time in November of 2011, the overt visual presence and subtle aroma of petroleum was encountered. 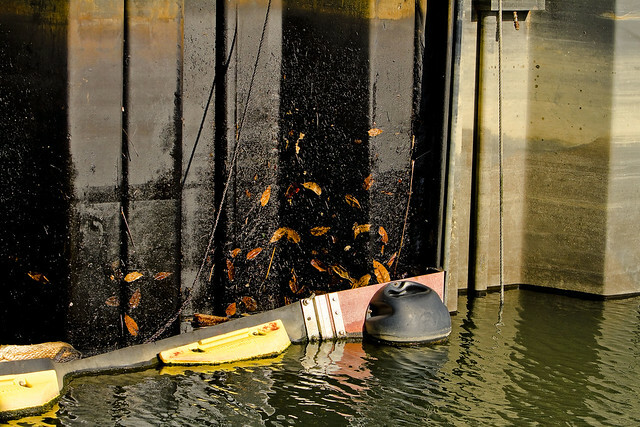 The black and yellow structure is what is known as a hard boom, and is designed to contain surface contamination and “floatables”. It extends to a few inches below the surface. 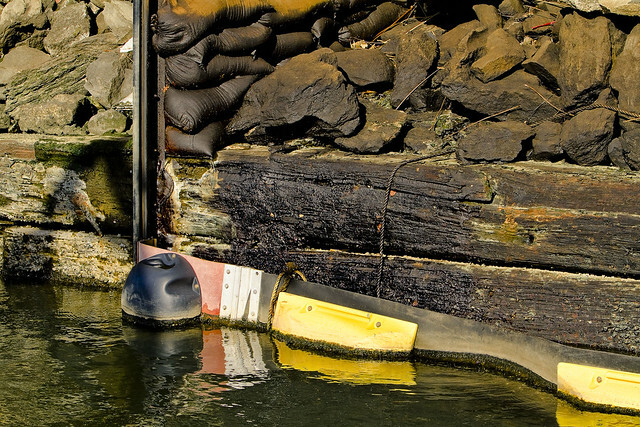 The steel plating at the site is painted with oil, undoubtedly splashed up by wave action during storms at high tide. The white objects which are saturated with petroleum products are absorbent booms, designed to wick up the free floating product. The leaves in the shot above are literally stuck into the gluey residues of the oil. You can see the high tide mark left by the water on the cleaner bulkhead which is just beyond the hard boom. 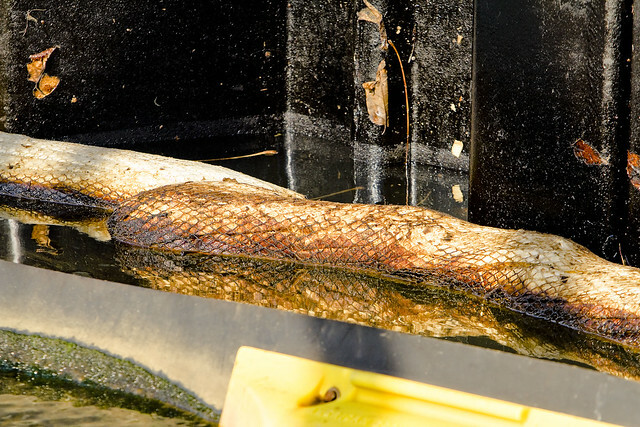 Perhaps this is the source of oil, which many have reported to me over the course of the last year, which has been witnessed as it floats toward the East River. 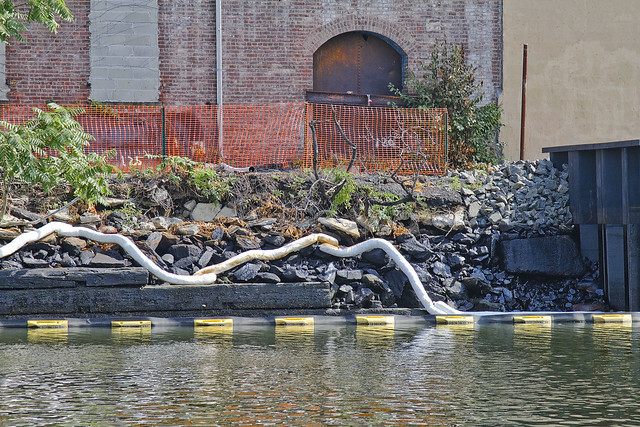 It is not news that there are environmental contaminants floating freely in this troubled waterway, nor is there any revelation to be found in the fact that petroleum products are commonly observed pooling and flowing about the Newtown Creek watershed. What is news is that this is in Queens. 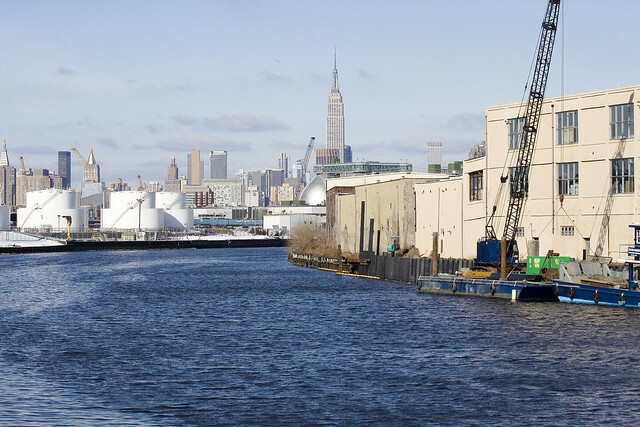 Much of the attention, and deservedly so because of the large and growing population of Greenpoint and Williamsburg, which Newtown Creek receives is all about Brooklyn. 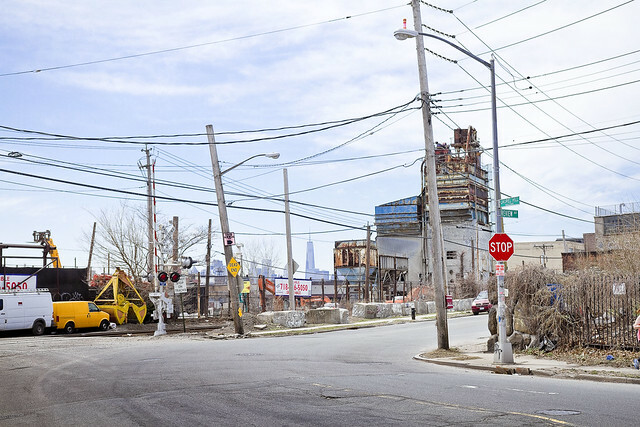 The north shore of the Creek in Queens is often left out of discussion (and from both remediation and environmental benefits funding) because of its relatively tiny population and industrial character. One of the questions which this blog has asked since day one has been “Who can guess all there is, that might be buried down there?”. In the case of the Blissville Oil spill, the question might as well be “How much there might be?”. 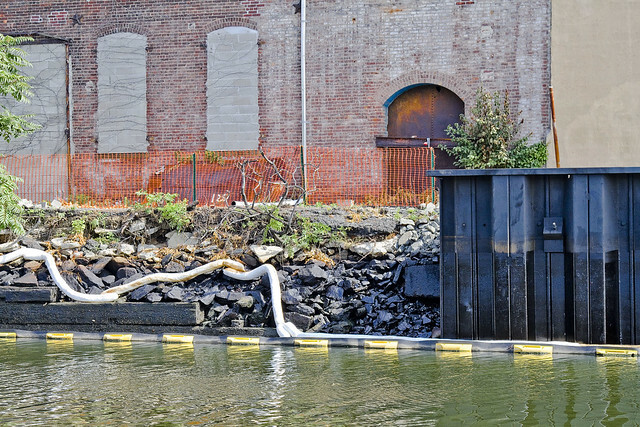 This is just the beginning of a new Newtown Creek story, the tale of the Blissville Oil Spill. I fear it will be the first of many such stories, as we move into the Superfund era.